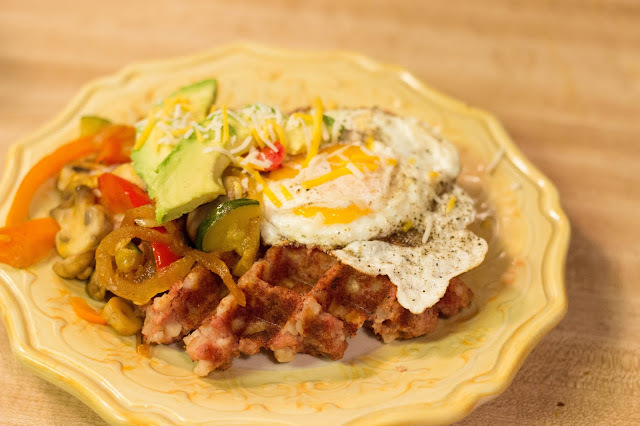 Corned Beef Hash Waffles | For the Joy of Life. 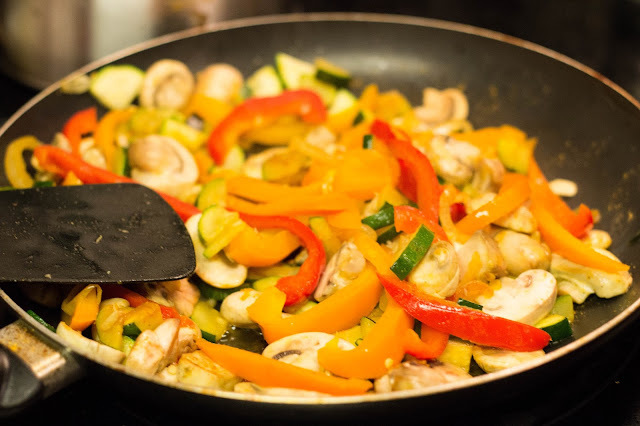 A Tasty Tuesday recipe on a Thursday?? 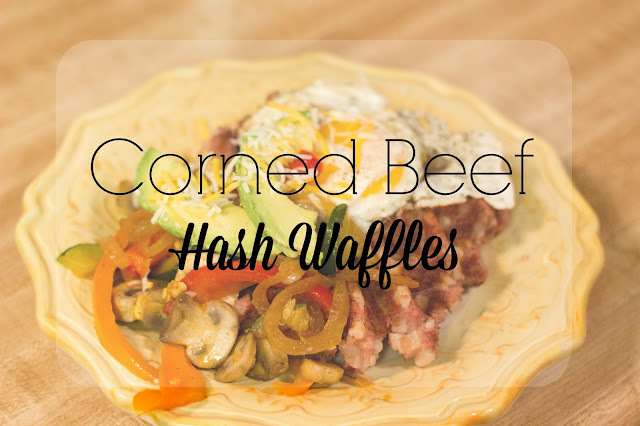 I know, I know... but just let it be because I'm super excited to share these corned beef hash waffles made with HORMEL® MARY KITCHEN® Corned Beef Hash! These waffles are very flavorful, hearty, and filling. 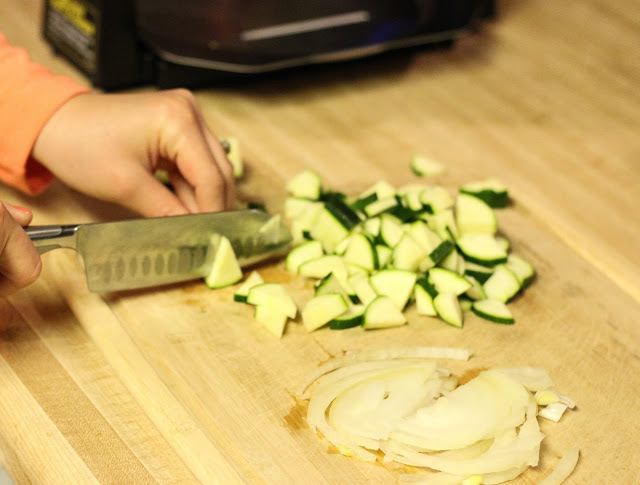 They are perfectly seasoned and so simple and quick to make! They are also very versatile because you can choose what toppings to add creating a unique waffle to fit everyone's taste buds. They are perfect to make for a family brunch and will treat everyone to a hearty meal they don't get to experience every single day. Begin to saute your assorted veggies in cooking spray and salt. 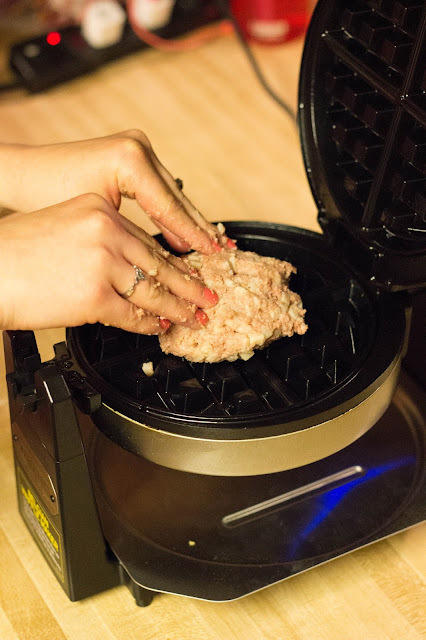 In the mean time, heat up your waffle iron. Open your two cans of hash and put it in a bowl. Mix in 1 cup of Italian Style Breadcrumbs. 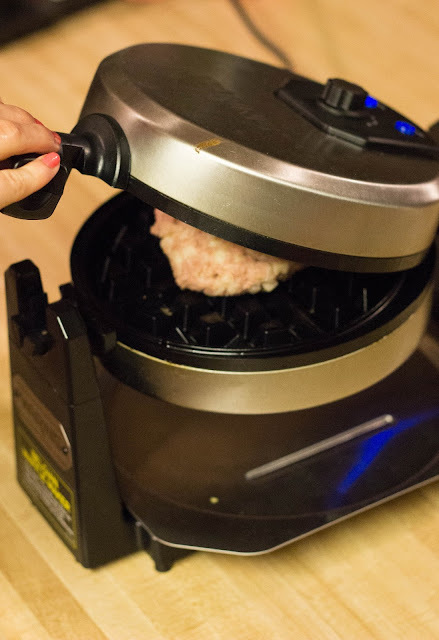 Once waffle iron is heated to medium high heat, spray it with cooking spray. 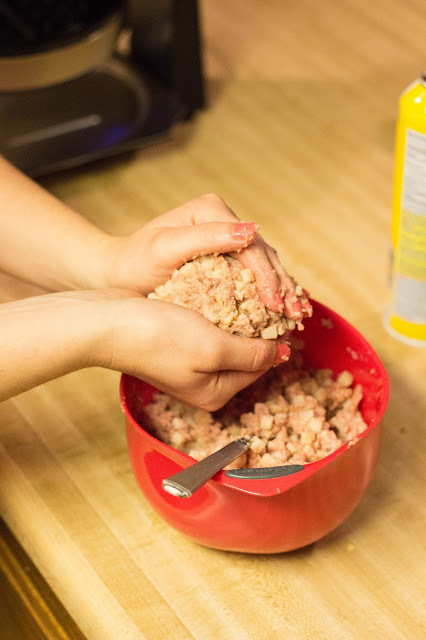 Then form a ball of the hash and put it directly to the middle of the iron. Close shut and let cook for 8 minutes. While the waffle is cooking, start frying your egg. Cook it however you like your egg. You can even try scrambled eggs to mix it up! Once the waffle is done, carefully remove it from the iron using a fork. Add your veggies, fried egg, some cheese, avocado, salsa, and anything else you think would be good on top! The options are endless! Enjoy your HORMEL® MARY KITCHEN® Corned Beef Hash WAFFLE! I purchased all the ingredients from my local Super Target and found everything I needed quickly and easily to make these hash waffles. They had plenty of HORMEL® MARY KITCHEN® Hash products to choose from and they were well stocked! When I was younger, I really despised breakfast. What?? Yes. I really did! I knew it meant cold cereal, frozen waffles, or a muffin I didn't even really want. I've also never really been a morning person, so if I had to be somewhere in the morning, I was running out the door in a hurry with a granola bar in my hand or I'd just skip breakfast all together. As I got older I found out that there wasn't really a specific time you had to eat breakfast and so many doors were opened! Brunch is now one of my favorite things and I love all the different foods you can make for a brunch! I'm so excited to make these hash waffles again for friends and family sometime because they really do make a flavorful, and special meal. 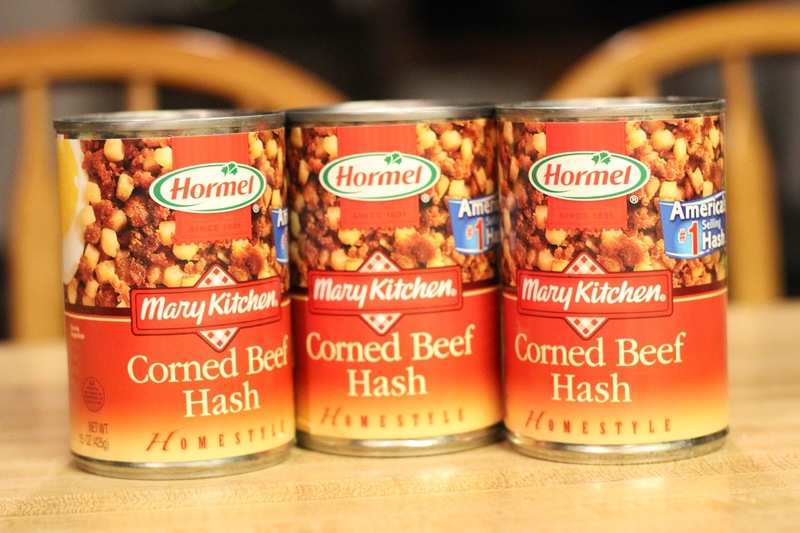 I'm also excited to find other ways to use HORMEL® MARY KITCHEN® Hash products in other brunch recipes. It is so versatile and convenient to use. I love that all you have to do is pop open the can and stick it in a skillet, and you already have a hearty and flavorful brunch right in front of you. 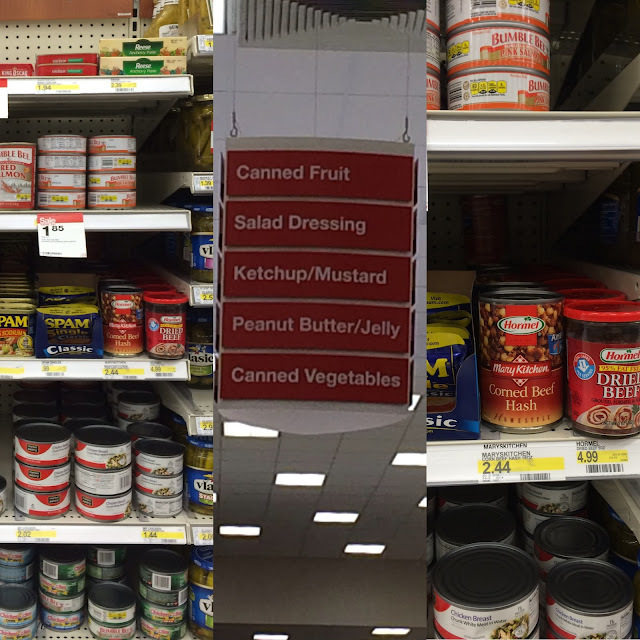 The hash is sold in just about every store so it is very easy to find. Everyone you treat to brunch will love the flavor and think you spent all day making it! Make sure to try out these hash waffles and use this coupon that ends on March 17th 2016 to SAVE $1.00 on the purchase of any two (2) HORMEL® MARY KITCHEN® Hash products! What is your favorite Brunch recipe? I'd love to hear about it in the comments!